For a while I’ve wanted to post some reflections on the characters/story of At Sea: or more accurately, reflections on how players have reacted to different parts of the game. It seems a bit weird to be writing about a game that I’ve released over a year ago, but the fact is it is still my largest released project to date, and chances are if you’re reading this, it’s because you saw Why Am I Dead At Sea somewhere! Some of this might be interesting to those who have played the game all the way through. Certain things that were intended but may not have been communicated to the player, remaining questions the player may have after finishing the game, and random musings. NOTE, if you haven’t played the game yet, this will have SPOILERS so you should not read it if you care about that kind of thing. I will “white out” some of the big stuff (select the text to see it) but the entire game consists of twists/reveals, so talking about the story in any capacity will contain spoilers. 1. People really don’t like Xu, huh? One thing that I feel like I could have done better with was making Xu a more sympathetic character. Watching people play the game, a lot of people really dislike her, I mean, a lot, and that wasn’t exactly what I was anticipating. I mean, she’s not what I would call a great person. Even in the very first conversation you have with her, there are clear hints that she is being deceptive/manipulative. But the game’s overall opinion of her is meant to be roughly neutral – she has flaws, but is ultimately a good person. Unfortunately, I don’t think her dialogue depicts this side of her as well as it could have. I’ve seen players grow weary of him and his character-arc, which is understandable. To progress through earlier parts of the game, you have to spend a lot of time with him. Personally, this is my least favorite aspect of the game from a narrative perspective. In general, Alton has been the most difficult character to write, and his personality/story arc have gone through multiple dramatic changes over the game’s development. Originally, Alton came off as a much worse person in the script, and reacted quite differently to certain events in the story (for the worse). The initial conflict between him and Xu was meant to be, essentially, a re-enactment of the game’s larger conflicts/themes, on a very tiny stage. But conveying all of this was difficult, because Alton is the first character you meet and play as, and is sort of the tutorial character. He also seems like an okay person at the beginning – he has flaws, but they are flaws often given to an “underdog” protagonist. So I was very worried that players would falsely interpret Alton as the underdog protagonist, and that his opinions were those of my own, or the game’s. I ended up rewriting a lot of his dialogue to reduce the chance that he would be interpreted this way. This ultimately made his dialogue less substantive – he simply has a lot less interesting things to say. A common complaint is the lack of closure on just who exactly you are. This is half-intentional, but something that I could definitely improve on. There are obvious challenges – you are dead, you have lost all memory of your past self, and the other characters in the story didn’t know much about you even when you were alive. So, opportunities for character-development are scarce. One option would have been flash-backs as you recover pieces of your memory, but this was outside the scope of the game. It could also disrupt the focus of the game – ultimately, the protagonist is not supposed to be the center of attention – that place is reserved to the cast of the living. I will say that the ghost does have a full back-story and character – it’s not for lack of these things that the ghost’s former personality is vague. It was more of a conscious decision not to go too far into those details. But there is something in-game that tells you a bit more about the protagonist, which isn’t laid out very clearly: when you go into the “minds” of Darryl and Gwen, and pose as someone they knew – the reason Smilla is able to speak as if she were these people is because she went through the same problems they did. So when she poses as Darryl’s wife and speaks in first person, she’s not actually talking about his wife – she’s literally talking about herself, and something she went through at a previous point in her life. I’ve already mentioned that Alton went through some rewrites, but what else was planned and got changed/removed, or what wasn’t planned but made its way into the game? As far as rewrites, Darryl also saw the large majority of his dialogue get replaced over the course of development. He initially was a more upbeat, personable character who cracked jokes to everyone on the ship – then in chapter 3 it would be revealed that this was a facade. But it never really felt convincing to me. It gave his arc a twist, but it didn’t actually make sense. The whole point is that he’s apathetic, so the idea that he would spend energy pretending to be anything else didn’t add up. So, wise-crack Darryl was replaced with dour Darryl. I had always planned on full possession, but the implications of this mechanic from a story perspective were unpredictable and at some points I felt I had written myself into a corner – or worse, into a situation where there were too many possibilities to account for. Most of the events in chapter 4 were changed in development as a result of the diverging possibilities. The entire section where Gwen is put under suspicion and has to be proven innocent was added very late as a means of re-focusing (or limiting) the player’s agency. On the other side, I had never planned on being able to “upgrade” your ghost form so that it looked like your former self, or the possibility of interacting with people while in your ghost form. This means that I also never initially planed the instances where you go into the minds of Gwen and Darryl and fully unlock them by assuming the role of someone from their past. In retrospect, the game seems like it would be really incomplete without these parts, and they actually didn’t take very much time or energy to create, so I’m very happy that I added them. You probably wouldn’t know it if you didn’t play through the game multiple times, but the epilogue for the game is different not only depending on what ending you get, but also some of the decisions you make earlier on. The same characters will have a conversation, but the direction that it goes can vary based on how they’ve interacted throughout the game. This was another last-minute addition to the game that almost didn’t make the cut. The “bathroom ghost” was yet another last-minute addition to the game. I wonder what % of players have actually found this part, and what they made out of the ensuing dialogue. Today we finish our look into the projects that didn’t quite make it to the finish line. Given that some of them are pretty old and didn’t take especially long to finish, you might wonder what else I’ve been doing. For one…life. It’s pretty intense, and this past year most of all. But I’ve also done some work patching/updating Why Am I Dead At Sea with small features and fixes, and will continue to as much as I am able. Lastly, among all the craziness I’ve started prototyping an idea that I’m really interested in. I don’t say that lightly, as the last idea I was really “interested” in turned into Why Am I Dead…and we all know how that ended up. So, hopefully, I’ll have some progress to show in the near future, and this can become a real dev blog once again! This was another game jam submission for the Philly Game Forge, and this time we had 24 hours to complete a game from scratch! I’d done a couple of Ludum Dares in the past, but this would be my shortest jam ever, so I was pretty excited to enter it. It was 24 hours onsite, so we were able to stay overnight at the Forge and work through those magical hours where your body goes through the seven stages of grief as it slowly realizes that you aren’t going to give it any rest. I came up with a little 2D stealth game where enemies can’t see you, and can only catch you via direct contact. But there’s a catch – you can’t see yourself either! Using only contextual audio/visual cues, you have to navigate through the game’s levels and past enemies. As the levels become more expansive, losing track of where you are becomes more of a threat. To assist the player, there are objects that react to when the player walks over them, and sounds for when you hit a wall. There is also the ever-present sound of your foot-steps, which change based on the surface you’re walking over. Thick grass will help you keep track of your location, and you don’t even have to worry about running into wild Pokemon! It gets pretty hectic later on, but using water and rock paths to “hear” your location will help! Truth be told as much fun as I had working on this game, by the time 24 hours was up, I was quite sick of the thing, and had grown bored of the concept. I even considered not submitting it. But it’s good that I did, because people seemed to really like it! In fact they liked it so much they elected it the winner of the jam and gave me a nice wooden plaque for the occasion. You can also pick up hoagies and use them to murder people, you’re better off not knowing why. Despite my misgivings at the eleventh hour, I got a huge charge out of creating this little game. You can play it in-browser or download the whole thing on my site, but note that the download will let you play at a better resolution. This was a little platformer that I had the idea for way, waaaaay back, over a year ago. I did a tiny amount of coding for it eons ago, which I ultimately re-purposed for the other platformer I talked about in the last post, but finally picked it back up in Jan 2016. Given the haphazard way I worked on it, I really couldn’t say how long it all took me. It’s a minimalist retro platformer – really genre-breaking, I know. I wanted to make something small and neat, so I did just that. It’s a platformer where every time you jump, the world inverts, and previous…oh, well, a GIF will explain it faster than I can. So, the world switches between white/black every time you jump. Platforms, spikes, and obstacles will phase in/out based on which color you’re in. The idea was pretty simple – what is the core mechanic of platformers? Jumping. On platforms. What if I made it so that every mechanic was tied to jumping – every mechanic was tied to your decision on when and how to jump. The result was a game with very few mechanics but many interesting scenarios to design. This was probably the most fun I’ve had designing game environments by far! Twice the jumps = twice the complexity in design! Chasing enemies were added to turn the game from a slow puzzle-platformer to a faster paced action-platformer. I’m pretty happy with this thing, and at this point it’s basically done. The only thing it lacks is an ending (as of now you’ll just run into an incomplete level that can’t be beaten), but once I pop that in there I’d love to upload it to any channels I can. Until then, you may not be surprised to find out that you can play the current version on my website! Well, that concludes this mini-series. At some point I’d like to redesign my website and include a section for these kinds of things – it doesn’t feel right putting them up side-by-side with something as large as Why Am I Dead At Sea. But I would like for them to have a space of their own. Hello again internet. Quick life update: I’m in the process of moving (again) and have gotten a full-time position as a software developer, so I’m back to the develop-on-the-side life like I was before. Which I’ve been enjoying so far. That whole full-time indie thing was more successful at burning me out than anything else. I think I could’ve written 5 long-winded blog posts around that, but I like condensing it down into one sentence better. It occurs to me that I’ve worked on a bunch of stuff since At Sea that I haven’t published or really talked about (at all). This is either because they were jam submissions, or because I simply didn’t complete them. In gamedev, we place a premium on full, finished games, and for good reason – it’s kinda important to be able to finish completed games (and really hard! ), so it’s a skill everyone wants to cultivate. However, the small experiments, the unfinished prototypes…these are valuable too. So I thought I’d take some time to talk about the smaller stuff that hasn’t been shown to the masses. This was a small project that I worked on almost immediately after releasing Why Am I Dead At Sea – about a week after its release, I believe. It was for a game jam that I was (lovingly) pressured into participating. It was part of the Philly Game Forge‘s Dev Night – basically, a game-development-oriented shared space that runs lots of jams, and has a weekly meet up. This jam in particular was called the “Juice Jam”, and the idea was simple and interesting – give everyone a template for Breakout in Unity, and make them create the “juiciest” version of it that they can. If you’re unfamiliar with the concept of “juice” in a gamedev context, I would highly encourage you to watch the Juice it or Lose it talk. I teamed up with local artist Carley for the jam, and we had a week to create something with this Breakout template. It was an interesting challenge, since I had never done anything in Unity prior to this. From a development standpoint, I got to tinker with a lot of things I hadn’t previously used, such as tweening and particle effects, and I was able to laser-focus on a really interesting design challenge – juice it! Although I could critique my work on this jam submission for several pages, ultimately I’m happy with what we came up with (especially the art!) and had a ton of fun working on it. You can see or play our jam submission on either Carley’s site or my site. It’s a bit hard to evaluate exactly how much time I put into this project, as it was scattered over a longer period of time, but I was most productive, and did most of the work, in a period of about a week. 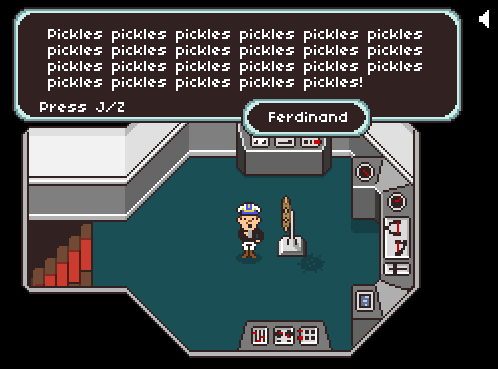 This game was meant to be an experiment in fourth wall breaking. The idea goes like this: there’s a super cute and colorful platformer reminiscent of SNES games (especially Kirby) – but it’s not quite finished. The writing has typos, there are little bugs in the game…and even one of the main levels is missing. Then you get to the end and see a “warp zone” feature which can take you to that missing level you saw earlier but couldn’t access – huh, I wonder what’ll happen? Well, now you’ve gone and done it…the game takes a darker turn and you have to navigate through an increasingly broken/glitchy/horror game to get to the bottom of the implied narrative. Or that’s the idea anyway. I mostly implemented the actual platformer, felt that nice sense of accomplishment, and called it a day. The game as-is does already exhibit a bunch of different action/platforming mechanics with lots of different levels: you have a stomping attack that can be used to steal certain enemy’s abilities, and use those to get through various predicaments (like I said, reminiscent of Kirby). Although I didn’t finish the game, I found the work to be really fun. This was the first platformer I worked on, and the most level-design-intensive project for me. And while the art style is still not really very unique to me (it still wears its influences on its sleeve), doing the pixel art was fun and I like how it turned out. So why didn’t I finish it? Well, to be honest, I still find the idea fun – but “fun” doesn’t cut it for me. There was a particular feeling I was trying to express with the game when I originally came up with it, but without getting into specifics…I don’t really have that feeling anymore. Maybe if that feeling returns I’ll happily return to this and finish it in one swoop! You can try out the prototype here! I know that in order to finish projects, you can’t depend on silly things like feelings – trust me, I very often didn’t “feel” Why Am I Dead At Sea when I was working on it. But as this was a side-project that I just wanted to do for fun, I think it’s okay to recognize that my motivations for starting it are no longer present and move on. Hi internet! It’s been a while – let’s catch up again. Let’s see. A while ago I launched my first commercial game on Steam. The game was in development for far longer than originally intended, and its release was much overdue. Unfortunately, though I say I “launched” it, I don’t know if that’s really the fitting word, as most of the traffic the game received (maybe 90%?) is purely due to its place on the Steam storefront, meaning I did not succeed at publicizing the game or getting it the exposure I think it deserves. And overall, it has garnered a small fraction of the views that its much smaller and cruder prequel had (not talking about sales here, just hits), which is pretty discouraging. After all, the main reason I decided to work on this sequel was because of the apparent interest that was shown in the original. But now the game is out there, and I can say that I finished and shipped a product with a pretty substantial play-length, considering the game consists 100% of scripted content. There has been a lot of positive response from the people who have played it, and some really glowing user reviews that have just been a joy to read through. I haven’t been as productive after release as I thought I would be. I had all sorts of ideas for projects that were crowding my head, which I thought I would just speed through after being caught up on such a large undertaking. Nope, turns out I was completely burned out from development and all of the stress leading up to release. I have been working on several projects and have participated in local game jams, but so far haven’t been as possessed to publish something else with my name on it as I had been with At Sea. Partially I feel like I’ve proven to myself that I can see a project through to its end, so I don’t feel the pressure or need to finish every little idea that I come up with if it turns out that it isn’t really as interesting as it seemed at first. Which is usually the case. The fickle developer who can’t complete anything is a cliche, but in truth I think it’s important to also know when to leave a project. Yes, you can learn a lot by completing a project, and it is an important skill to be able to “finish” something. There are definitely diminishing returns however. The skill of “finishing” is only one of many, many skills that are required in game development, and it may not even be the most important one in this era of early access and open betas and development live-streaming and twitter GIFs and oh man, things change really fast don’t they? But one thing I have definitely noticed is that my productivity and general ability to make stuff is so much greater than before I had originally set out to ship a premium game. When working on other things, it kinda feels like the training weights have come off. I’ve just spent some time catching my breath. Just a quick little piece of news: Why Am I Dead At Sea is going to launch on May 11! Woooo! Yep, that’s all for now. Some pretty good news this time around! This is Art with a capital A, folks. Where should I start? Hmm, oh yeah – maybe with the fact that my game Why Am I Dead At Sea is basically done. It’s kinda insane. I almost don’t believe it. After working on it for so long, and continuously pushing the finish line further and further back, you kind of forget that finishing is even possible. I’ve gotten so used to adding things to Why Am I Dead At Sea, that the thought of not adding another thing to it just seems crazy. There’s something I’m missing, right? Well…Not really. All the alternate endings are finished. The epilogues too. The dialogue in the game has been rewritten three times over. I must’ve redone the menus half a dozen times. There’s even controller support! This realization comes with two feelings – relief, but also anxiety. When I admit that the game is finished, I start to panic because a part of me still wants it to be better. Surely there’s other things I can do to improve it even more, just that little bit extra that will put it over the top, right? Imagine how much better the game could be, if I’d only add ______ . The bottom line is, I will be moving forward with distribution/marketing on the basis that the game is in fact complete. Yeah, at the same time I will also be making small tweaks here and there, if only to satiate a compulsion to tweak. But don’t worry, I can stop whenever I want to. I’ve gotten all incorporated and everything, and now I can work on putting my game on Steam! Well, technically it’s already on Steam, but there several extra things I need to do. Namely, I want to implement Steam cloud saves, achievements, and trading cards, and make sure everything is working smoothly with both Windows and Mac downloads. It’s a bit hard to say how long this will take, but progress has been very smooth so far. Speaking of all that, this post is doubling as a bit of a recruiting call. You see, I want a final wave of testing with a larger group before the game goes public, and I also need to test and make sure the game is actually working with all these Steam features. That means I need some new testers! 3 ) If you played the original Why Am I Dead – who do you think was the serial killer? The last time I made a call for volunteer testers I was really impressed by how many people responded, and how dedicated many of them have been. If you volunteered before and I didn’t get back to you, I apologize – but also know that this test phase will require much more people, so feel free to volunteer again! Thanks in advance to any volunteers! Next blog update I may be releaseing a date of some import. Sorry everyone, no long blog post this time – just a short update for a bit of news. But oh, what news it is. 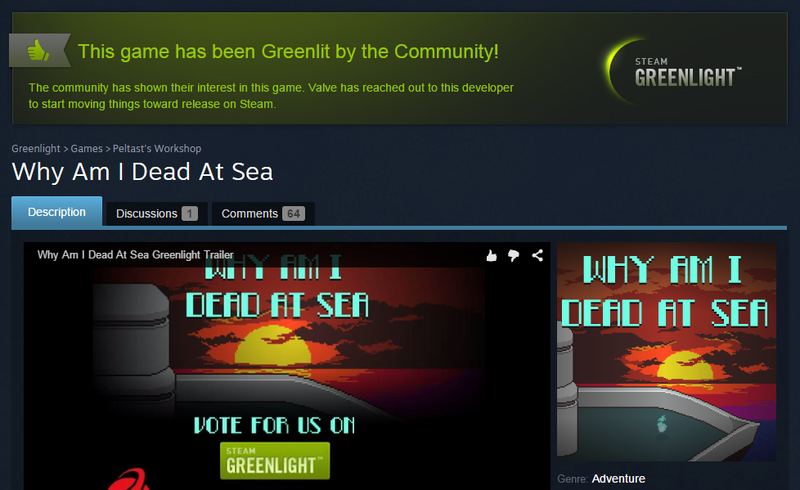 Why Am I Dead At Sea is going to launch on Steam!!! Talk about a boost! Thank you everybody for your votes, support, and kind words. Now, I have a game to finish!